I recently received a question on the forums regarding the creation of an anonymous event handler method. Pretty much every event in the .NET Framework employs the same signature, with slight variations. According to the EventHandler page on MSDN, the standard signature for an event handler is a method that returns void, takes object as the first parameter, and takes a type that has been derived from EventArgs as it's second parameter. Microsoft has adhered to this rule with excellent consistency. Because of this, the ability to attach to every single event within a specific class is not too terribly difficult to do. Nevertheless, I've found that at times, I've wanted to know which event is actually being raised. Perhaps I want to handle all the events in a single method, but I want to know for certain the name of the event raised on the object to which I'm subscribing. This is what I've created below. // This is the name of the event subscribed to. // This references the parent EventHandler. // This the generic handler that is used to subscribe to the object. The EventMonitor is constructed by passing in the object whose methods you wish to subscribe to. It contains four methods, two of which subscribe or unsubscribe to specific events and two that subscribe to all the events on the object. /// Subscribes to every event on the Sender. /// Unsubscribes from every event on the Sender. /// Stops monitoring a specific event. // Get the event information for the specified event. // Unsubscribe from the event. // Remove the handler method from the list of handler methods. // Get the handler type for the specified event. // Get the ParameterInfo collection for the event handler's invoke method. // Get the collection of types corresponding to the event handler's parameters. // Create an array of generic type parameters. // Get the type of the AnonymousDelegateClass, and fill the generic parameters. // Get the constructor for the class that takes the string value. // Create an instance of the class, which will subscribe to the event specified. // Get the Handler method, which will be the event handler for the event. // Create a delegate of the same type of the handler type based on the Handler method. // Add the event handler to the object specified. // Finally, record the method subscriber in case we need to remove it. If you run this application, you'll notice output from every event that is raised on the DateTimePicker. 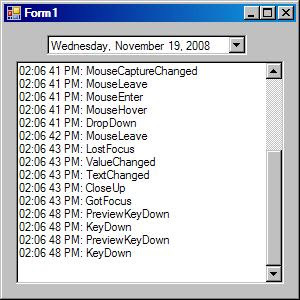 The event name is displayed in the RichTextBox, along with the time it was raised. I have found this class to be helpful in determining which events are raised, whether events are raised, and in what order they're raised.